What size prints can I order? Can I order several sizes on the same order? Yes. You can add as many products as you like by selecting the product and and then "Add to Cart". You can see what you have in your "Shopping Cart" and edit items and quantities at any time. When you've finished, select "Checkout" for the payment process. A4 [210 × 297mm], A3 [297 × 420mm]. A2 [420 × 594mm], A1 [594 × 841mm] and A0 [841 × 1189mm]. A4, A3, A2, A1 frames can be purchased cheaply from most department stores. We recommend frames include a matt border to ensure that the prints don’t stick to the glass. What kind of paper do you use for your posters? Our digital media selection delivers sharp, clean images with stunning colour and vibrancy. AO, A1, A2 and A3: Durable Bond 160gsm Coated Paper. All prints are ‘Print to Order’; we print once your order is placed and after receiving payment, production time is 24 -48 hours. If you need you order by a certain date, please contact us so that we may assist you as best we can. We ship using Australia Post for domestic and international orders. We send Australian orders via Australia Post, Regular Parcel Post. Once you order has been shipped we send a notification email with a tracking number. We send International orders via Australia Post, International Economy Post. Once you order has been shipped we send a notification email. The shipping amount is displayed in your shopping cart and the final shipping cost will be calculated during checkout. For international orders, we will contact you for a custom quote. Please note that any free shipping coupon, unless otherwise specified is not valid for orders outside Australia. Mastercard, Visa and American Express via PayPal. 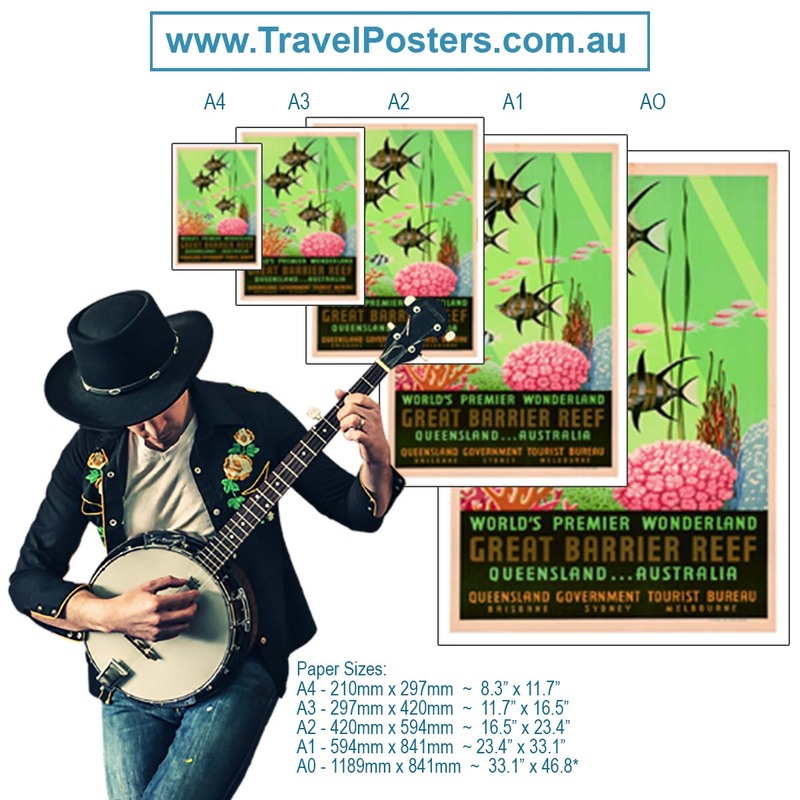 If you are not satisfied with any item you've purchased from TravelPosters.com.au, we will happily refund the Original Purchase Price, including the Shipping Cost to you, provided the item is returned to us within 14 days of delivery. Only Standard Postage Prices Apply. Any goods returned are your responsibility until they reach our warehouse. Please be aware it is your responsibility to ensure the item is packed appropriately and returned to us in original condition. Return shipping, postage and any handling charges are your responsibility.